Thousands of students across the country are making a tough decision: Should they be trying to get their dream job, and how do they know if they’ll actually enjoy it? 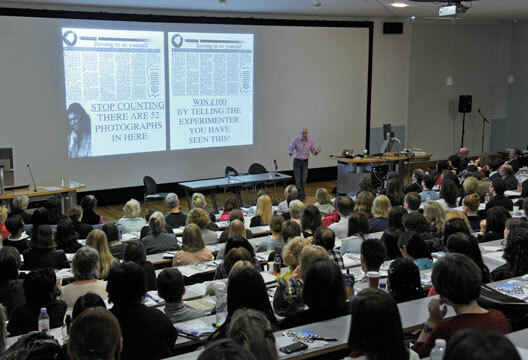 Whether by design or coincidence, the 2011 British Psychological Society ‘Psychology For All’ conference provided an opportunity for psychology students – and others – to find out how. Prior to becoming a psychologist, keynote speaker Professor Richard Wiseman followed his passion into performing magic, and as his passions evolved alongside his own emotional development and increased maturity he discovered psychology, leading him down the route that today makes him the best-known psychologist in the UK. Professor Wiseman believes that working out what you want to do with your career requires creativity, and the first step is to answer a question: What is so special about you? ‘We’re typically blind’, Wiseman says, ‘to what makes us stand out’, but there are nevertheless unique attributes to each of us. If you can work out what energises you and combine a subject area you have passion for with a method of working that suits you, you are on the right track. His philosophy of turning his spare time hobby into an income stream is how he started as a magician: ‘If you think about the long tail, outside of the really big careers and companies, there is opportunity for more people to be more diverse in more niche areas’. Even if you’ve decided you want to work in advertising, or management consultancy, or an art gallery, how do you decide which is the right company? Sarah Lewis, MD of organisational psychologists Jemstone Consultancy, says that out of everything that makes a company enjoyable to work for, the two key factors are Reward-rich Environments and Virtuous Behaviours. In short, the best workplaces are ones that thank you frequently and are full of ‘nice’ people: Lewis states that ‘too many companies focus on what’s wrong, not on the positives and praise’. Yet Professor Wiseman thinks that this traditional view is a little outdated and that the flow of time will result in fewer people having offices, with careers lasting shorter durations, and with more self-employment and freelancing across all sectors. This is easier now than ever before, he says, as the rise of social media, Twitter especially, allows even the most stalwart introverts to socialise, network and connect with relevant business contacts without leaving the comfort of their own homes or offices. The best advantage of the multiple freelancing approach, coined as ‘slashing’, is that it gives flexibility to try out multiple types of roles without the risk of having a CV that shows impatience. Sharon Peake, Director of Talent and Assessment at Reed Elsevier, argues that graduates shouldn’t worry about trying as many as 20 jobs, and that the most important part of the job hunt is finding if you fit with the culture: ‘Do whatever you can to find out about the culture, even asking at interview. Remember that the interview is less about the interviewer and more about the fit.’ Culture isn’t just about the type of people you work with, but as simple as deciding how much time you want to be at a desk, whether the company has a culture of independence or collaboration, and working hours. Examples like this are why appreciating fit between candidate and client is so important, and why it’s so hard to predict. Psychometrics and behavioural profiling are excellent tools for helping identify fit within a company that knows how to use them, but also lead to the uncomfortable situation of a candidate being told that they have been rejected based on a psychometric test. Ms Gartshore says that we should take this as good advice as we may well have ended up unhappy in that role, although the opportunity should still be taken – as it always should – to obtain feedback. It is also critical to remember that if told that it was purely down to fit, that you must not be any less honest when you next fill in psychometrics as it is better to be rejected from the wrong place than be miserable six months later. This all makes choosing an initial job or career a difficult and slightly frightening situation, and perhaps it is, but the challenge involved brings its own rewards. Common to all the speakers interviewed at the event was the opinion that graduates, whether of psychology or another subject, shouldn’t expect to be able to make these decisions on their own. Whether asking friends, parents, lecturers, career services or training and development professionals, even an hour can help clear your thoughts and help you with biggest decision you’ll make this year. www.psychapp.co.uk is now open to all. Advertisers can now reach beyond the prime audience of Society members that they reach in print, to include the many other suitably qualified individuals online. Society members have the added benefit of being able to sign up for suitable e-mail and RSS alerts, and we are looking to add more member-only benefits as the site develops over the coming years. Please let the Managing Editor know what features you would appreciate, on [email protected]. Please help us to spread the word. Recruiters can post online from just £750, and at no extra cost when placing an ad in print.